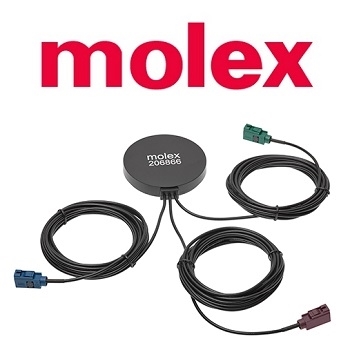 Molex has added new antennas to its product line with the release of 3-in-1 (4G/Wi-Fi/GPS) External Antennas. The products are ideal for consumers in the automotive and non-automotive transportation industries that need a waterproof 4G, Wi-Fi, and GPS solution for telematics, remote monitoring, tracking and other wireless applications. The antennas are fully balanced, dipole and IP66-rated. They have circular housings that have a 77mm diameter width and are 15mm tall. This solution is especially useful for applications needing extended connections, about 3m from the antenna housing. The cable length can be fully customized with various connectors options. Molex 3-in-1 External Antennas are compact, fully waterproof, and peel-and-stick for easy installation and removal. Thanks to three cords coming from the housing, the antenna can link to multiple radio device applications at once. Compared to similar products in the market, these antennas are more compact and feature lower noise values in the GPS in the 1575 MHz band with 28±3 dB Gain. Click here to learn more about the 3-in-1 (4G/Wi-Fi/GPS) External Antennas.